Back when Rick Ross and his bodyguard were first arrested on charges of kidnapping and aggravated assault and battery, we predicted he would quickly post bail and return to his time-honored tradition of hanging around outside Wing Stops. 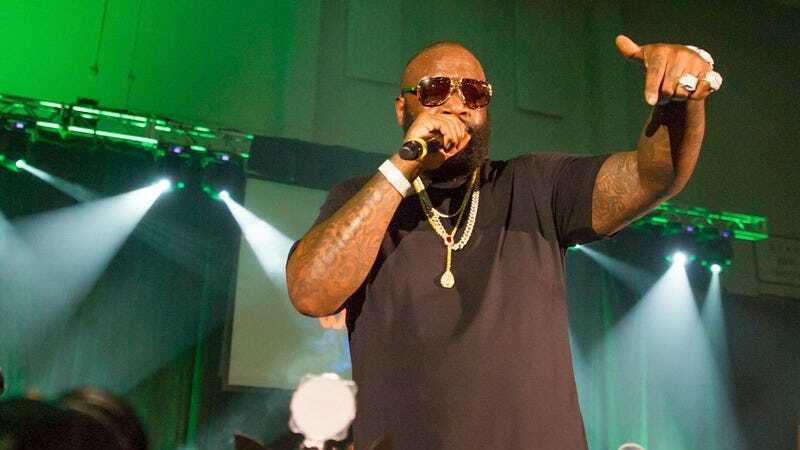 However, we then learned that the musician and his employee had been denied bail—a legal wrench thrown in the works of Ross’ soda-acquisition-and-documentation machinations. But the universe has moved to right that balance, and one week later, Ross is again free to Instagram his lifestyle. Pitchfork reports the rapper has paid a $2 million bond and been released from Fayette County jail. The bond was apparently paid with $500,000 in cash, a $500,000 bond from a bail bondsman, and $1 million in equity from his mansion. The arrest and charges stem from an incident in which Ross got into an argument with a groundskeeper on his property, then allegedly pistol-whipped him, breaking the man’s jaw and injuring his neck, all of which is certainly a chill and cool way to have a debate with your employee. Ross’ lawyer assured the court his client’s home and property would be turned over to the county if Ross threatens any witnesses—which, if you have to assure the court of that, you’re starting off your case with a bit of a handicap.